8.9 Our Score If you find yourself a victim or pet fur and allergies, this is a versatile hoover that can really make your home more hospitable and clean. What Is the Shark Lift Away True Pet NV681UKT? When looking for a solid vacuum cleaner that will last several years, many people turn to popular, well-known brands. Shark is a subsidiary of a UK registered holding company called Euro-Pro Europe Limited and actually has an interesting range of vacuum cleaners. One vacuum cleaner that piqued our interest is the Shark Lift Away True Pet (NV681UKT). 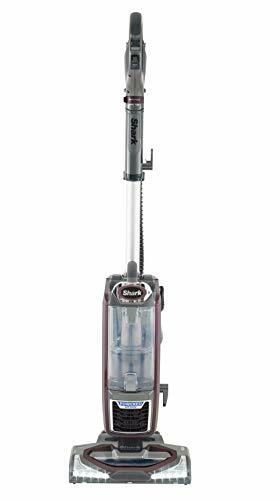 The Shark Lift Away True Pet is an incredibly versatile corded upright vacuum cleaner that can be used for a wide range of cleaning tasks around the home. Many of which are very practical, and it’s backed by some very positive user reviews. As the name would imply it’s specifically designed towards pet owners who have trouble with allergies and/or getting rid of pesky never-ending fur. We bought one to write this Shark NV681UKT review and to let you know how it performs, especially considering it has a less than modest price tag. Versatile – The design of the Lift Away and the number of attachments makes it an incredibly useful vacuum cleaner around the home. A car detail kit is also available for cleaning vehicles. Bagless – Bagless means you won’t ever have to worry about running out of vacuum cleaner bags. Floor Compatible – Carpet and hard floor modes can be toggled by a switch on the handle which is quick and easy. 5 Year Guarantee – Shark is so confident in their product that they are offering a 5-year guarantee which is more than you’ll find on other similarly (or even more expensive) priced models. Low Dust Capacity – The dirt receptacle is a little on the small side with a 1.1-litre capacity. Corded – Considering the practicality of this hoover, the cord is a negative point. However, you don’t need to worry about battery life or a lack of power. Lift Away Functionality – what makes the Shark Lift Away True Pet unique is that you can remove the main unit from the wand. This allows you to easily use the wand with the power brush head still attached to easily reach under furniture, or use the additional tools for floor to ceiling cleaning around the house. Pet Power Brush – This version includes the pet power brush (although you can buy a cheaper model without this attachment if you don’t have pets), which is great for picking up pet hair on carpets and upholstery. 99.9% Dust and Allergen Filtration – The Shark Life Away features a HEPA filter with advanced seal technology which means it’s capable of capturing particles as small as 0.3 microns and trapping them. This means that the air that is expelled from the pet-friendly hoover is hygienic as well as allergen and pollen free. The Shark NV681UKT hoover isn’t particularly sleek or stylish. However, it’s designed to be an interesting adaptation of your regular upright vacuum with the ability to become much more. It resemits it’s old-fashioned cousin in a number of ways with the long silver wand, and large box-shaped unit (or ‘pod’) towards the head which encases the 750-watt motor, filters and dirt receptacle. Styled in grey with maroon red accents it certainly won’t be your living room showpiece, but it’s still a smartly designed hoover that can compete with the top of the line stick hoovers in terms of functionality. It’s not the most simple hoover to figure out at first and requires assembly upon unboxing. You’ll need to connect the ‘wand’ with the chosen floor head, insert the handle into the wand, slide the ‘pod’ or main unit onto the wand and then attach the 1.8-meter flexible hose (which is already connected to the handle). The aim of the Lift Away, is that you can easily remove the ‘pod’ to hold in one hand while you use the wand and your chosen tool to clean the floor or ceiling, or remove the wand and attach a tool to the handle for other tasks such as cleaning the sofa or car. The handle has two switches, one which automatically changes the mode of the main floor head from carpet to hard floor, as well as the suction control level. The power button is located on the ‘pod’ itself. The dirt receptacle is located in the ‘pod’ and can be released and then held over a bin for emptying. The Shark Life Away True Pet also features a pre and post motor filter arrangement, with the latter including two HEPA filters. All can be hand washed (clear instructions included with the purchase) – the pre-motor filter kit must be washed every 3 months, and the two HEPA filters once a year, or as needed if the red indicator light comes on. Main Brush Roll Head – A power driven brush that includes and LED light and can be used for all floor types. Pet Power Brush – A smaller power brush that can be used for stairs and upholstery. 2-in-1 Duster Crevice Tool – Works as both a duster for cleaning around the house, as well as a crevice tool for tight spaces. Upholstery Tool – Contains a stiff bristle brush to remove embedded debris off a number of surfaces, though you can also remove the bristle brush for other applications. The performance of the Shark is impressive by any standard, whether you use it as a standard floor cleaner or with the attachments. It really shines on carpets and can get even the most stubborn of pet hair and dirt out with its power driven brush and higher power setting. The LEDs are a nice touch as you really get to make sure you’ve left nothing behind. It also has no problems with hard flooring which is easy to transition to. The pet power brush works similarly to the main head, though because it’s smaller you can use it attached to the wand or handle with the pod removed to easily clean the stairs. With the pod removed the flexible hose makes it easy to really get the best out of this machine. It’s possible to attach the included tools either at the end of the wand or the hose which means you can use it for general dusting, sucking up cobwebs, cleaning furniture and more. Because it does such a fantastic job picking up dirt/debris (regardless of whether it’s dried mud, cat litter or normal dust) and hair, most will need to empty it after cleaning their home though this is easily done. When using it as an upright the wheels and flexible joint makes it really simple to manoeuvre around the house. The only negative point was that it’s slightly less effective on hard flooring – especially for edges. Overall, it’s an impressive pet-friendly machine that for once actually does a great job of picking up all kinds of pet hair. It also works just as well as a regular vacuum cleaner and is easy to assemble and use the different attachments once you get used to it. It does a satisfactory job cleaning vehicles, though there is an affordable car detail kit that can be purchased separately to really valet clean your car if you want to. The Shark Lift Away True Pet isn’t a cheap corded vacuum cleaner at just under £300, but it’s one that for once actually provides suction that lives up to the hype. Those who want a lighter vacuum cleaner with similar functionality should rather consider the cordless Dyson V10 which we reviewed here, but it’s priced correctly in our opinion. If you don’t have pets, you can purchase a cheaper blue/grey version for less than £200 which excludes the pet power brush. If you find yourself a victim or pet fur and allergies, this is a versatile hoover that can really make your home more hospitable and clean. It’s a little cumbersome until you get used to it, and it’s not going to win any awards on styling, but for functionality, it’s an interesting model that comes recommended. It’s also built to last and backed by an impressive 5-year guarantee. Is it possible to purchase attachments and spares separately? Yes. Shark sells a wide range of spares on its website which also everything from filters and attachments to a replacement dirt receptacle. Is this good for homes with wood floors? Yes, it works well with all flooring types. However, you may opt to purchase the Dust Away attachment with a pad which is better suited for picking up dust from hard flooring. Do I need to replace the filters? While replacement filters are available online, the filters are designed to be hand washed. The pre-motor filter kit should be cleaned every 3 months, and the two post-motor HEPA filters should be cleaned once a year by hand (with running water). Is it easy to remove hair from the main head? Yes, it’s possible to remove a part of the base on the bottom of the main head to cut away tangled hair and remove other trapped debris. How much does this hoover weigh?